The 6 Volt generator is self powering/energising. The remnant magnetism builds up the voltage in the generator without the need of a battery. A 6 Volt generator does not need much attention. It works flawless for many years. The 6 Volt generator delivers about 9-10 amps maximum. The voltage is not really regulated. Due to the design of the generator the balanced load (lamps and Coil) and the presence of the battery, the Voltage is more or less controlled. When the old cut-out Relay is being replaced by the solid state(6Volt relay) one, it should work right away. Assuming the old electrical system worked without problems. If it is unknown if the generator works, or if the electrical wiring is correct, problems can show up. Be aware that all our regulators and relays have been tested for functionality after production. Please refer to the repair manual or workshop manual for repair and testing of the generator. 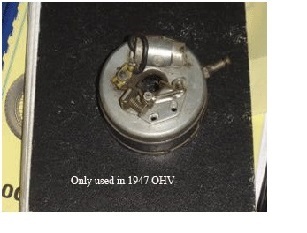 The 6 Volt generator (3 brush) only works with the 74750-38 ;old nr. 4785-38 model cut-out relay. Our replacement for these old cut-out is the 6 Volt solid state Relay as shown below in the figure. This Relay is on the market for almost 15 years, not showing any problems. This regulator works only with the two brush type generators. It will not work on the 3 brush generator! Since the principle of the two brush 12 Volt generator is the same as the 6 Volt, it can happen that the generator does not deliver output. The generator is self energising and should produce power when running. The Electronic regulator needs a proper ground made, made though the mounting flange. Be sure both metal surfaces are clean, so proper contact is made. Be sure the system works with normal points. Points closed (red LED is on) coil is beeing charged. Points just open (red LED goes off) coil releases energy, thus generating a spark. Connect the meter to the red wire of the ignition where it is connected to the coil. Crank the engine until the red light is on (coil =charged) Readout must be near the voltage of the Battery. If much lower (>1 Volt), somewhere in the electrical system resistance is in play. Connect the DVM/ meter r to the black wire of the ignition where it is connected to the coil. Red light is still on. Readout must be less than 1 Volt. 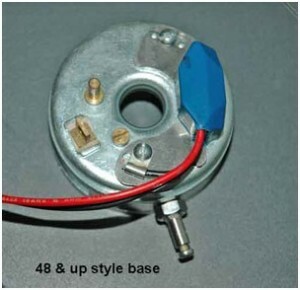 If higher, the ignition housing, timer base or ground wire is not proper grounded. Check for rust, painting etc. The ignition module will fit many types of ignition bases. If one feels he has to adjust the holes in the ignition system for fit, it is for sure not designed to work on that timer base. Please recheck make/model of timer base. Do not adjust the Ignition Module. Coil: Check coil type for right operating voltage. Be sure the spark cables are propperly attached to the coil. This can be checked using an Ohm meter. Main switch in off position!Choose the Ohmic range and measure between the spark cables the resistance. One should find a value of approx. 10-20 kOhm. Some users strip the spark cables and squeeze them in the coil. DO NOT DO THAT!! The risk is that the spark finds a short way inside the coil, preventing a good spark at the spark plugs, or even none at all. Resulting in a engine with just one cylinder working, or even none. Just cut them traight, and press them over the accepting pins of the coil. One can prepare a hole axial to the copper core of the cable. The pin in the coil will find his way easier by doing this. Please check which type of base is fitted on your bike. The year of the bike can differ from the model of the ignition base which should be mounted. This due to the long history and restorations of a bike. Warrenty: No warrenty is applicable if a problem occures in the battery load system. In case the battery disconnects from the circuit/wiring while engine running at high speed and thus loading the battery, a high energy dump takes place in the wiring. (e.g.broken wire or blown fuse) In situations where this occurs, the Ignition module will fail due to high energy peaks caused by the moment of disconnect. E.g. a 6 Volt system generates a steady 30 Volts output on high RPM if no battery is connected. 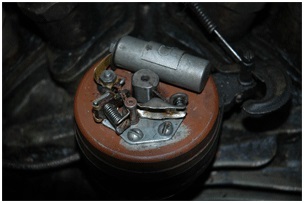 The Bulbs will blow; same for the Ignition module. Also in the battery a internal mechanical failure can occur. Not visible to the eye, and is difficult to detect.